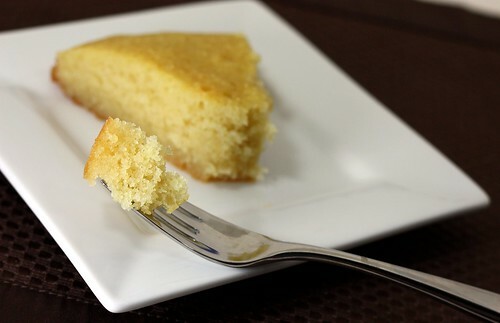 30 by 30: Ravani (Greek Syrup-Semolina Cake) – Elly Says Opa! Ravani is basically a Greek sponge cake. Made with semolina, it’s very much a no-frills cake, as far as “accessories” like frosting go, but that doesn’t mean it’s not absolutely fantastic. Like many Greek desserts, this, too, is doused in a simple syrup mixture flavored with a bit of honey and cinnamon. The result is an incredibly moist, flavorful cake. I’ve always loved ravani, but it wasn’t really something we had often as I was growing up. It kind of fell off my radar, but when I saw Maria’s mom’s version was famous…well, I had to make it! This cake keeps incredibly well due to the syrup, so this is something that you can easily make in advance (in fact, it really only gets better). I halved the recipe below and baked it in a 9″ cake pan. On the one hand, I’m glad I halved it because it’s not exactly health food. On the other hand, I wish I had more of this to eat because it was so good. If only I could eat this stuff every day and not gain a billion pounds. Sigh. Preheat the oven to 425ºF and lightly grease a 13×9 pan. Combine the flour, semolina and baking powder in a small bowl. In the bowl of an electric mixer, combine the butter and sugar. Beat on medium-high speed until light and fluffy. Reduce mixer speed and add the eggs one at a time, beating after each until just incorporated. Stir in the vanilla and begin adding the flour mixture a little at a time until just combined. Pour into pan and smooth with a rubber spatula. Bake for about 5 minutes then lower oven to 350ºF and bake until golden, about 30 minutes. While the cake bakes, place all the ingredients for the syrup in a saucepan and bring to a boil. Lower the heat, cover and simmer on low until the cake is ready. Using a ladle, add the hot syrup to the hot cake a little at a time. Set aside, cool to room temperature and serve.